Welcome and thank you for attending the Multiple Sclerosis Blog Hop. I so love a good cause and submit my tiny contribution to help. We want you to know that you may have the option to bid on any of the cards or make a donation directly to the MS Foundation on Linda's Page for MS. Multiple Sclerosis (MS) affects women more than men and is usually diagnosed between the ages 20-40 but like any disease can show itself at any age. It affects the brain and well as the spinal cord or the central nervous system. MS occurs when the sheath surrounding the nerve cells is damaged. Nerve damage is caused by the inflammation and the body's own immune system attacks the nervous system. At this point and time researchers are unsure what causes the inflammation, but state that is it mainly caused by a genetic defect, virus or both. Here is a short clip of the wobble in action and a photo of the inside of the card. Well happy Hopping! Here is list of everyone on the hop. If you get off track please hop back and go from there!! Linda at Fancy Framework.com is our Blog Hop Hostess. Girlia at Girlia's Cards---You are Here!!! Oh, what is a blog hop without Blog Candy right? Below is a photo of the I-Rock that I would like to give away. Just leave a comment on this blog and a way for me to contact you. No need to follow, but if you like what you see then by all means please do so. I will pick a winner on March 7th. Hi Gloria! Awesome job! I love how it moves! Glad to be joining you and the other talented girls on this great blog hop!New follower! What a great card!! I love how he is just having fun riding. This would be a great birthday card. What a cute card, I love it!!! TFS I will watch your video later this afternoon! Great boy card Gloria! I struggle with these so much! Thank you for supporting MS, my Mom unfortunately has this awful disease and it means a lot that you ladies are taking time to do this. Great boy's card! I need to make a birthday card for my great nephew and I think this cut would be fun to do! Love the card, it would be a great boy card. Great idea! That is too cute. I got to get some of those wobblies. What a good cause too hugs to you. Nice card, I have got to get some of those wobblies. Great idea for a blog hop, My husband of 32 years has Ms and I appreciate your help. TFS. ps..I am a blog follower now. This is an awesome card and an even more awesome way to raise money for a great cause! What a GREAT card!! Love the colors too. on I never new anything aobut MS so thanks for sharing the info. LOVE the card!! Great color combo. Thanks for participating in an MS hop. My husband 33 y/o nephew was diagnosed with MS last year. I love this card!! I know a couple of guys it would be great for!! Great card! I better get my Wobbles out of the drawer and use them -- great incentive here!!! LOL! Love your card. Im a new follower. This is a neat cut. The colors are great together. Wobbles seem to be the next item to add to my wish list. Great guy's card!! Love it! Cool card. 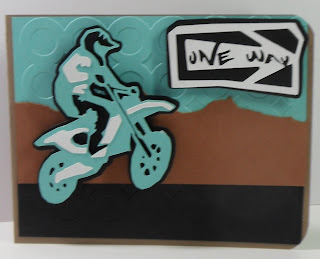 Did you use a Cricut cartridge for the motorcycle and sign? If so, which one? Thanks for sharing! I forgot to leave my email address. Always a pleasure stopping by your blog and seeing your projects. Great job! What an amazing card. Love the wobble idea for it! It totally looks like he is out riding!!! And thanks for the bit about MS. Two of my aunts have it and it is very sad to see them be able to do less and less everyday. So thanks for that! Have a great weekend!! Love the card and the reason for the hop! Also, I have something for you on my blog! Really like this card! My three boys would love it too! Thanks for the great idea!! What a great card. 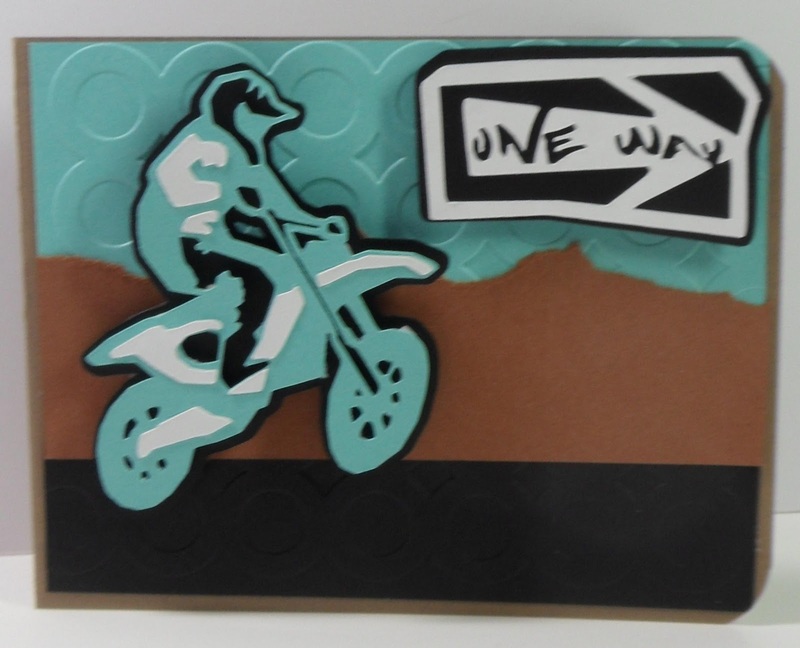 It is a great card for a BMX rider, and what a great giveaway as well. Great card! I love the wobbles. Just got my first bag of them! Can't wait to use them. The I-Rock looks like it would be amazing. Thanks for the opportunity! I really, really like this card! How perfect for a boy in his tweens! TFS! Your card is awesome and you did a wonderful job on the MS information. TFS! Wow, a video:) Love the card!! Thanks for the great guy card~we just never see enough of those, do we?